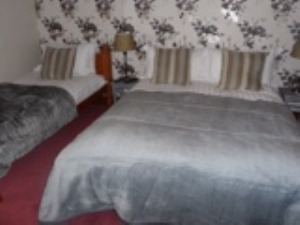 Double bed en suite room with shower. Hospitality table, hair dryers and toiletries. 80.00 per room per night normal occupancy. £55.00 per person single occupancy. Double and Single bed. En suite with shower and free standing bath. Hospitality table, hair dryer, flat screen TV with Youview ( catch up).